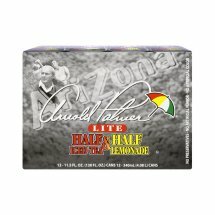 Product FeaturesContains 5% juiceNo preservativesNo artificial flavor or colorKosherMfd for:Arizona Beverages USA LLC,Woodbury, NY, 11797,USA.www.drinkarizona.comwww.arnoldpalmer.com© Beverage Marketing USA, Inc. Premium Brewed Blend Of Black Teas Using Filtered Water, High Fructose Corn Syrup (Glucose - Fructose Syrup), Lemon Juice from Concentrate, Pear Juice from Concentrate, Citric Acid, Vitamin C, Natural Flavors, Sucralose (Splenda Brand), Acesulfame Potassium, Gum Acacia.No Preservatives. No Artificial Flavor. No Artificial Color.